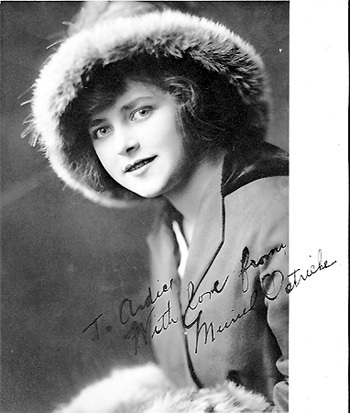 Muriel Ostriche (C) in a photograph signed in 1914 for Ardice Blanchard, when she visited the studios. Thanhouser Career Synopsis: Muriel Ostriche was a well-known Thanhouser actress from 1913 to 1915 and was the leading lady of Princess films. Biographical Notes: Born Muriel Henrietta Oestrich in New York City, on March 24, 1896, Muriel Ostriche planned to become an elementary school teacher. Her plans changed one day, while she was in high school, when she encountered W. Christy Cabanne on the street and was invited by him to take a screen test at the American Biograph studios. She did this, and in autumn 1911 she joined Biograph as an extra in several films, after which the budding actress went to Powers, Pathé, and then to the newly-formed American Eclair Company in Fort Lee, New Jersey, where she spent a year under the direction of Etienne Arnaud and appeared in many films. A Narrow Escape: In connection with a projected series of articles, The Photoplay Magazine sent a questionnaire which asked for a description of the most thrilling event in a player's life (the original questionnaire returned by Miss Ostriche is in the collection of the Film Study Department of the Museum of Modern Art). Muriel Ostriche submitted this: "I have had many a thrill in 'real life,' but of all the thrills I have had in 'reel life,' I think one experience two years ago made my heart thump more than any other one. We were putting on a comedy called A Tammany Boarder [released by Eclair on January 2, 1913]. In one scene I was shown preparing to retire, when a tiger is discovered coming into the room. Mr. Tiger jumps over the bed and I hide under the covers. Then the beast goes out of the room and I was supposed to become hysterical. It was some scene because the tiger could not, even by the wildest stretch of one's imagination, be called tame. In fact, he showed he was not, and even the director was just a little frightened. This I found out, of course, after the scene was over. "I vowed to never act with a wild animal again, but the next scenario required me to go into a cage with this same tiger. Did I do it? I did. It needed courage and I have that, so why not go into the cage? And then you know I didn't want anyone to say I was afraid. But in strictest confidence, this is a confession you know, maybe I was the least tiny bit scared. This picture was called The Love Chase [Eclair, February 6, 1913]. The cage was built around a garage, and I was to come out from it. Mr. Tiger disliked the camera and persisted in hiding in an automobile which was not in view. The only way to get him down to the foreground was to beat him. In the garage I could hear this growling, beaten beast. I knew the thing to do was to stare the tiger out. A woman was this beast's pet aversion, and he showed his hate. But I must act unafraid and feed him milk and meat. He objected to taking the food, and it was plainly a dangerous moment, for the great beast crouched, fangs exposed, truly threatening. I am still wondering whether my remarks, made with bated breath, could be discerned by those who later witnessed the picture. I remember saying over and over to myself as I acted my part before the angry beast, "Oh, let me out, please, I want to get out.'" Following her work with Eclair, Miss Ostriche had a brief stint with Reliance, after which she went to Thanhouser, where she was hired by Charles J. Hite. Her first Thanhouser film was Miss Mischief, released in June 1913. A 1913 Interview: The following interview with the actress appeared in a 1913 book by Frances Agnew, Motion Picture Acting. At the time of the interview Miss Ostriche was with Reliance, just before going to the Thanhouser studio. She relates her beginning in the film field: "One of the most wonderful examples of success as a photoplayer without having had any previous experience or training in stage work is Miss Muriel Ostriche, a dainty, bewitching little miss of 17 summers. Yes, it's true! She is only 17 and really looks younger. A bubbling bit of enthusiasm regarding her own work and the wonderful future in store for motion pictures, Miss Ostriche is a most entertaining little talker, and merely being with her imbues one with the same instinct of a determined ambition which means to win! "After a delightfully informal introduction, Miss Ostriche and her interviewer snuggled up together in the only vacant chair in the Reliance Studio at the time, and Miss Ostriche, breaking the ice with her winsome personality and musical voice, said: 'Now, shall I tell you how I began?' Having heard so much regarding this question from outsiders, the truth of the matter from her own lips was just what the interviewer was eager to know. "'Well, you see, I have never been on the stage at all. No, I didn't even take elocution lessons, but went right into the pictures. It was this way. I was only 15 going to high school. I went to see the moving pictures very often and liked them immensely. Then, one day I thought I would like to play in the pictures. Wasn't that nerve? But, just the same, I went down to the Biograph Studio and they thought I looked very much like Mary Pickford. (She was not with them then.) Anyway they decided to give me a trial the next day. Well, I went down, but oh! how scared I was! "There was a big crowd at the studio - it was a special picture, I think - it seemed to me that five hundred eyes were looking on, though, of course, there were not that many - and I was shaking in the knees. But I must have gotten through all right because they told me to come down again the next day. Then, I was to go in their stock company but it was going out West and to other parts of the country and Mother wouldn't let me go. You see I was too young to go away all alone on so little experience. Well, then a friend of mine suggested that I go over to the Pathé and see them, so I did, never thinking it would bring anything, but the director of the Pathé decided to put me in a picture on trial, and in that way I worked with that company too. Then the week following they were to let me know whether or not I was to join their regular stock company, but in the meantime the Eclair Company, who had seen me in the pictures, asked me if I would come up there and play in a picture with them. I thought I might as well make the $5 a day with them while waiting for the Pathé, so I went over to their studio. "'Oh, I was frightened! The picture was to be a school girl comedy and about 12 girls were there that morning. The director stood us all up in a row and then told me what I was to play. I did not know the story then but I found later I was the lead. Just think of it! The Eclair liked my work so well in that picture that they asked me to come into their stock company right away and not wait for the Pathé, so I did. I stayed with the Eclair for a year and a half, and then the Reliance offered me the ingenue leads in their stock company with an increase in salary, so now I'm here with them. "Miss Ostriche added that she hopes to make a big success in the pictures and is working hard to this end, but judging from her salary of nearly three figures (and she is only 17) and her many thousands of admirers all over the country it would seem that she has made 'a big success.' Note: Just before this book went to press Miss Ostriche accepted an offer from the Thanhouser Company and is now with that firm. "At a subsequent meeting the interviewer also had a delightful chat with Mrs. Ostriche, who is justly proud of her talented young daughter. In the course of the conversation Mrs. Ostriche spoke interestingly of Miss Muriel's persistence and determination to climb to the top of the ladder. She said: 'It is almost impossible to get her out for a social evening. She is perfectly happy and contented if left alone in her room, standing before a large mirror, and practicing facial expressions and various scenes and situations which include all the different emotions which bring versatility, and will make her just as clever in strong emotional scenes as in light comedy work.'" With Thanhouser: Charles J. Hite, president of the Thanhouser Film Corporation, was impressed with Miss Ostriche's acting and the favorable reviews her films garnered in the trade press, and in the autumn of 1913 he set up a special division, the Princess Department, to showcase her talents. For most of the next year she appeared in weekly single-reel Princess releases, usually with Boyd Marshall as her leading man. A note in the November 15, 1913 issue of Motography told of her activities: "Muriel Ostriche, as the little princess of the new brand of Princess Films, is so busy these days that she finds it impossible to get to her home in the Bronx any evening before seven. 'And then I am so tired I ought to go to bed at nine, but - .' But of course she doesn't." Issue of May 16, 1914: "The little leading lady of the Princess playlets recently has won several trophies for her beautiful dancing. It has been the custom lately, in New York, for the cafés on certain evenings to offer cups to the most graceful amateur dancer on the floor, and two nights in succession Muriel Ostriche carried off the prize in the largest and most popular restaurants. Her latest triumph was at the new Rector's. On this occasion she appeared in a soft cream-color frock and a golden headdress, eminently suited to her youthful beauty. Miss Ostriche says that she stands more chance of winning if she makes no special preparation for the contest. Going on short notice, she almost invariably carries off the cup. She also says she prefers to dance with a variety of partners, as novelty inspires her to invent new steps." At the time, Rector's was one of the best-known restaurants in New York City. Among the waiters there was Rudolph Valentino, who was a frequent dancing partner of Miss Ostriche and a close friend. A so-called taxi-dancer, Valentino would dance with patrons. At the time he was playing small parts in movies, including My Official Wife, a 1914 Vitagraph film in which Leon Trotsky, who was later to be a principal figure in the Russian Revolution, had a part. After some trouble with the law, and an uncertain early career in films, Valentino went on to great success and fame as a matinee idol. Upon his death of a perforated ulcer on August 23, 1926, he was mourned by countless women fans, and a memorial parade was staged for him in New York City. 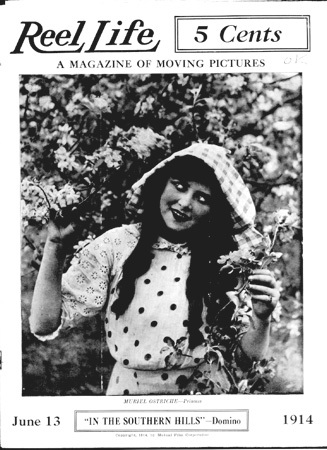 Issue of September 5, 1914: "The Moving Picture Girl, dedicated to Muriel Ostriche, 'The Little Princess of the Thanhouser Co.,' is the title of a song just published by the Wadsworth Publishing Company, 1547 Broadway, New York City. The music is by William J. Lewis and the words by A. Fagenson. The melody has a good swing to it and should prove popular, having already found favor with many motion picture audiences." William J. Lewis was Muriel Ostriche's piano teacher. "Seriously, Muriel knows how to dance so well that she appeared at the Grand Palace Motion Picture Exposition recently and won the cup away from a lot of others who had greater reputations. She has no fear of the Castles and if there was an open competition she'd take a chance against the divine Irene Foote Castle. She's so plucky, as a matter of fact, that she'll take any kind of a chance that Carroll Fleming wants her to. If it's the kind that means dropping out of a tree from a ledge. Muriel is there with the 'try-stuff.' 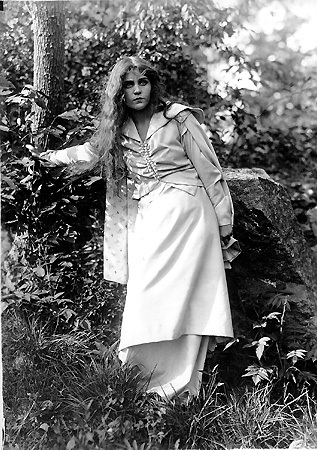 She has enacted the leads in almost 100 plays here, but before that time she was with Biograph, and at 15 was playing leads opposite Irving Cummings in Reliance. Before her Reliance connection, however, she played in Eclair films and gave exceptional promise, and when the late Charles Jackson Hite discovered her work with Reliance, he had her transferred to New Rochelle and created the Princess brand for her. This was in the fall of last year. "Then as her talents began to develop, she was placed in the parent company under the direction of Mr. Fleming, who is working wonders with her. One of her strongest emotional portrayals will be seen in The Madonna of the Poor, a two reel Thanhouser shown at one of the local theatres next Wednesday night. She was excellent in The Varsity Race, a Phil Lonergan story of two reels, opposite Irving Cummings, and in The Diamond of Disaster. She has an exceptional future before her and a wide range of emotional and serio-comedy parts. Her home is in New York City with her parents, where she was born." After Hite's death in August 1914, the interim management of Thanhouser placed her in other films, but she later returned to Boyd Marshall and the Princess productions. During the time she was with Thanhouser she lived at home with her parents at 565 West 144th Street, New York City. As did many other Thanhouser players, Muriel Ostriche departed by early 1915, during the time when the future of the studio was uncertain and the management lacked direction. In a conversation with the author, on February 23, 1988, Miss Ostriche reminisced about the days of long ago: "I remember that a boyfriend of mine, 'Corney' Shields, who at one time raced for the America's Cup, would bring his sailboat to the dock in back of the Thanhouser studio in New Rochelle and take me sailing. I recall that one day we went out and the water was really rough, and I got seasick. He had to help me back to my dressing room, and it was just awful. Charles Hite was originally a schoolteacher. He was very nice. He planned to have me do Alice in Alice in Wonderland, but he died, so it never happened. I remember that after Harry Benham - we used to call him 'Earl' - left films he went into the clothing business. All of the actors would buy from him, and he was highly successful." Later Years: Later, Miss Ostriche was with Universal, then Vitagraph, and then for three years with World, where she appeared in many productions. Still later, she starred in several films released through Arrow Productions and others. In July 1916 Miss Ostriche's address was 656 West 114th Street, New York City. Her chauffeur was Harry J. Halpin. In 1918 she married Frank A. Brady, by whom she had two children, Gloria and Mollie. Divorcing Brady in 1926, she married Charles Wesley Copp, Jr., and with him had two children, Charles Wesley Copp III and Jean. Muriel Ostriche Copp passed away at the age of 93, on May 3, 1989, in St. Petersburg, Florida, following a short hospitalization. She remained mentally alert until her final hours. Interment was in the Flushing Cemetery, Flushing, New York, after a service conducted at 1:30 p.m. on May 11th. Miss Ostriche was the last surviving major star from the Thanhouser studio. In 1987 she was the subject of a book, Muriel Ostriche: Princess of Silent Films, by Q. David Bowers, to which refer for detailed biographical information.